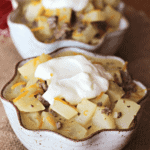 Cheeseburger Soup Recipe ~ Loaded with potatoes, hamburger, cheese and sour cream! Easy meal to warm you up! In a large pan brown the beef; drain and set aside. In the same pan, saute the onion, carrots, basil and parsley in 1 tbsp butter until vegetables are tender. Add the broth, potatoes and beef. Bring to a boil. Reduce heat; cover and simmer for 10-12 minutes or until potatoes are tender. Meanwhile, in a small skillet, melt remaining butter. Add flour; cook and stir 3-5 minutes or until bubbly. Add to soup; bring to a boil. Cook and stir for 2 minutes. Reduce heat to low. Stir in cheese, milk, salt and pepper; cook and stir until cheese melts. Remove from the heat; blend in sour cream.